An article by Joel Achenbach in National Geographic described the present American electrical grid as a kludge: “an awkward, inelegant contraption that somehow works.” It’s outdated; it isn’t suited to meet our power demands. And we are a power hungry society with an endless supply of gadgets that demand to be fed on current. We march around with chargers at our disposal for laptops and cellphones—I have both in my bag and I admit that I use them regularly. When out devices die, we become restless for power, expressing disbelief that power is denied to us. We’re a productive society, we tell ourselves. We need our power. In 2003 the eastern seaboard learned how weaknesses can compromise the grid. I remember that August afternoon well partly because later that night it gave me the opportunity to see the moon as I had never seen it previously. (It was so darned bright. I was awed, and the memory stuck.) I was free from classes and was enjoying an early dinner with S when a hum filled the air. We looked at each other in confusion and then everything shut off—including the fan that we were using to ward off the heat. “The power’s out,” I remember saying. “That’s weird,” said S. He checked the fuse box. No luck. “I think it’s the whole block,” I said. “What? No way.” We went outside to find our neighbors doing the same. “Do you have power?” “No, we don’t either.” And we stood there, unsure what to do with ourselves. S and I passed part of the night on our garage roof. We actually enjoyed ourselves, but that’s beside the point. The point is that our grid was never meant to support the network it currently covers. 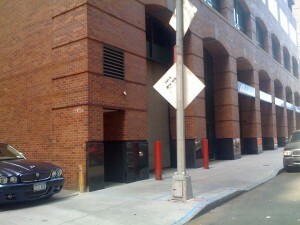 Exterior of the Pearl St. Station. 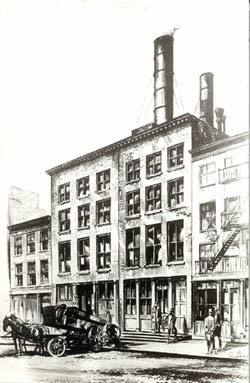 At 3 pm on September 4th, 1882, Thomas Edison unveiled a system for commercial electric lighting and power in lower Manhattan—the first of it’s kind in the US. He threw the switch in JP Morgan’s office. Good marketing: Electricity would be good for businesses. This demand drove the construction of the Pearl Street Station and ushered in the electric utility industry. Edison had found a means of successfully competing with gas lighting, which was already established. His plan featured a reliable source of central power generation that could be safely and efficiently distributed. But it was far from easy going. Edison needed to figure out how to generate enough power. He wanted to use a generator (a dynamo), but at the time, there weren’t any in existence powerful enough to serve his needs. Edison did what he knew how to do: he developed the ‘“Jumbo” dynamo, a 27-ton machine that produced 100 kilowatts, enough to power 1200 lights.” It took six such generators to power the square mile of lower Manhattan the Pearl Street Plant Serviced. 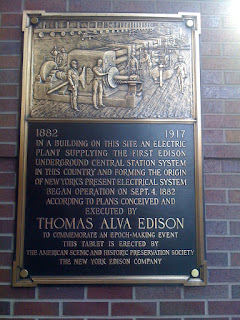 By October 1, 1882, less than a month after the opening the station, Edison Electric boasted 59 customers. By December 1, it had 203, and a year later, 513. The smart grid, Achenbach writes, needs to be more automated, self healing, and tolerant of green initiatives. It will inform us about usage, and allow us to make choices about consumption that are associated with cost. Like the Pearl Street system, our grid works despite its problems, but they are a lurking concern. 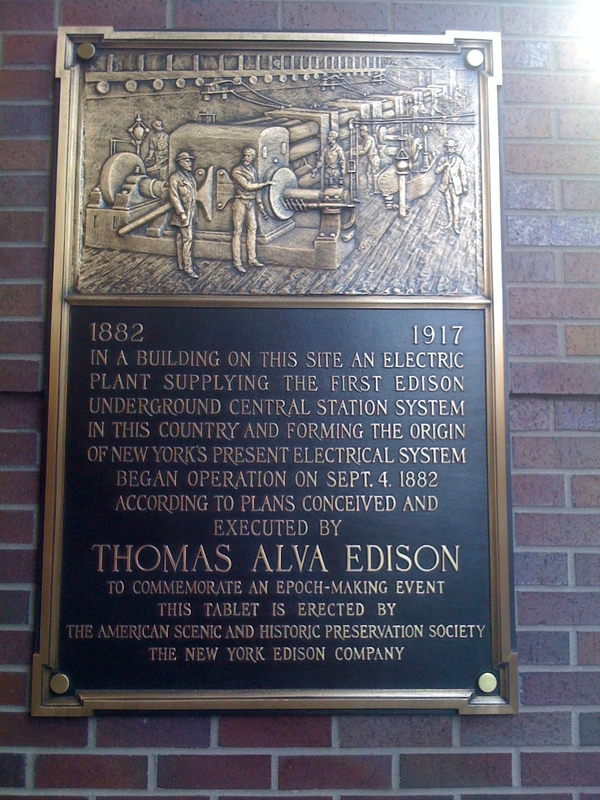 Plaque marking Edison's power plant. Believe it or not, less than one percent of the energy used to power NYC comes from renewable resources. So what’s the holdup? Good question. Better, smarter, cleaner energy is not cheap. Utility executives worry about what happens if the wind doesn’t blow or the sun doesn’t shine—they like stability, but the comfort it offers appears to be rather thin. As demands for power grew, Pearl Street tried to stretch to provide the supplies needed. Transporting energy over distances was an issue for Edison because he used direct current (DC). His competitors, Tesla and Westinghouse, were proponents of alternating current (AC) and believed it could meet these demands as well as those from businesses for higher voltages. Though Edison was hesitant to concede, AC eventually won out. Still, the Pearl Street station operated successfully in downtown Manhattan until a fire broke out in 1890. The station was rebuilt and it continued to power the city until 1912 when it was finally decommissioned, but it showed us the way. And it lit our skyline. But as in the case of the DC to AC power transition, it’s time to look to other alternatives for urban areas. What are your cities and towns doing to manage electricity usage? Let’s hear it below. While you type your response, feel free jam to Journey. I don't know that my area has really looked at electricity consumption in anything more than a token attempt. Here we're mostly focusing on reducing car usage. 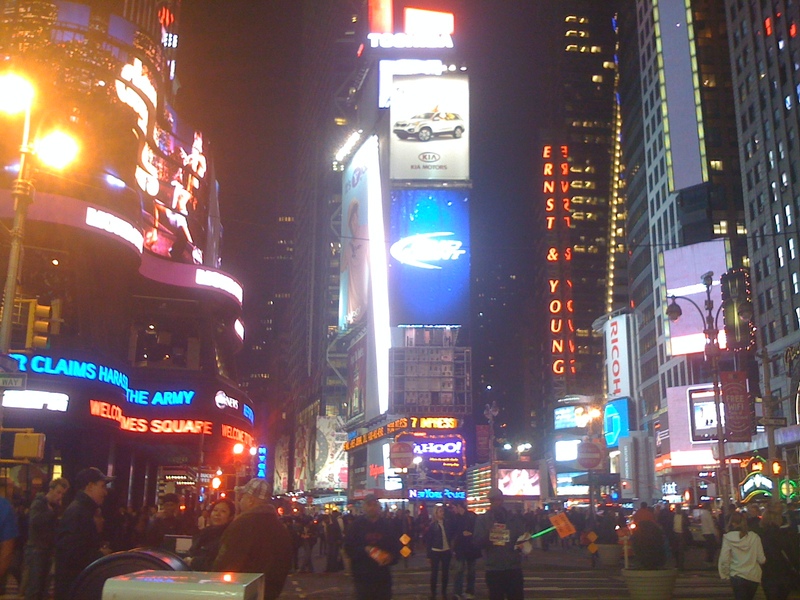 I confess, I have devoted serious thought to moving to NYC strictly because of the "city that never sleeps" aspect. I am VERY nocturnal, and a place in which there are at least some services and business open at the times I'm most active is very appealing. The 24-hour aspect is really a major factor in why NYC is home for me. I wrote about the issues S and I had getting food past 8 pm in southern Florida—I've grown so used to living my life on my own terms that I think I would have a hard time trying to adjust to the schedules (i.e., local times) of anywhere else. I'm aware of the incredible amount of energy it takes to give me these conveniences, and I'm certainly interested in finding more efficient ways to power the city. There is a lot of waste that happens currently—for example, putting our office lights on a timer or a sensor would probably help us save a bit, but because we're in an older building, this may be hard to do. For now, some of my coworkers have taken matters into their own hands: shutting the lights off when they leave for meetings or at the end of the day, making sure the refrigerator is shut (sounds simpler than it actually is, trust me! ), and printing only necessary items. It's a small step, but we're constantly told these sorts of actions add up. I wonder if that's true. My guess is, it depends. I think the best energy savings can be found in making better use of what you already have: things like carpooling, turning off lights, etc. At worse they're not making a noteworthy difference. On the other hand, if some new item or piece of equipment must be purchased, the net energy savings are much more dubious. Yes, a shiny new Prius burns less gas than a 10-year-old sedan. But not enough to justify the new car. Same for new appliances, and any number of related measures. In general - and granted there are some huge exceptions - I think the least expensive option is often the most energy-efficient overall.